“Once upon a time, in a faraway land called Holland, in a city called Delft, I was Fred’s teddy bear.” Thus begins the tale of a teddy bear who was Fred’s best friend. Fred was a little Jewish boy who had to leave his home and his parents, and live in hiding during the Second World War. The story is told from the point of view of Bear who doesn’t quite grasp what is going on. But he senses that something bad is happening and is scared that Fred will forget him. But Fred never parts from his only friend. First, they go to Grandpa in Amsterdam, where Fred is warned not to tell anyone who he is. Bear doesn’t get it: Has Fred done something wrong? And what is the yellow star that Grandpa has sewn onto his friend’s coat? And then, living with Grandpa also becomes dangerous, and Fred is given to a strange family. He hides out with them until the war is over, and all this time Bear makes sure to look after him. The two do not part even after Fred is reunited with his family and the world isn’t a scary place anymore. This is the true story of Fred Lessing, who moved with his family to the USA after the war. Even after he grew up and had his own family, he kept Bear as a reminder of what he had been through. Many years later he gave him to the Yad Vashem Holocaust Museum in Jerusalem, so that other children could learn about their story. Nowadays, it is worthwhile to devote a moment to thinking about the ways in which it us possible – and necessary – to speak to really small children about the Holocaust and about the Second World War. Bear and Fred succeeds in clearing a safe path for such a dialogue, one in which there is historical truth, fact, but also tenderness and compassion, love and hope. The author has been in touch with Fred Lessing and received his permission to write his story. The result is superb. There are no horror stories in the book and it is perfectly suitable for small children in pre-school or the early grades of elementary school. Bear and Fred is first of all a sensitive tale about the unusual relationship between a teddy bear and Fred, the little boy who plays with him … The teddy bear’s point of view enables a delicate and screened recounting of the events … Iris Argaman, a gifted writer and poet, is offering a magical, lyrical story. This is the place to mention the contribution of the original illustrations to the understanding of the text and the clever use of gray figures for wartime and illuminated figures for what follows, as well as the complex expressions of the characters, who are drawn with a sensitivity appropriate to the text. The story shows its readers that although a great work of art is made out of pain, it is capable of filling the readers with joy and hope. There’s no doubt that Bear and Fred is going to win a place of honor on the bookshelf. The book is wonderful and exciting, and so are the illustrations! This is a wondrous lyrical tale, brimming over with faithfulness and love … Iris Argaman is a creator of high quality. Here writing is lyrical, poetic, full of feeling, but she never spills over into sentimentality. In this book she has also succeeded in conveying a sense of isolation, pain and fear, without overloading the tender souls of her readers. 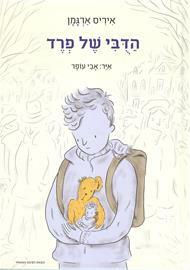 The illustrations by Avi Ofer are very sensitive.